If you are looking for our 2015 production of Cinderella at the Victoria Theatre, Halifax please click here! The 2009/10 pantomime for the Victoria Theatre, Halifax was Cinderella. You can find lots more photos in our Cinderella Facebook photo album. And four of the cast were out and braving the rain! Thanks Neil (Buttons), Jennie (Cinderella), Alice (Prince Charming) and Anne (Fairy Godmother!). Here's the centre spread of our new flyer for Cinderella! Take a listen to the new radio advert for Cinderella! As part of the marketing campaign for the panto, there is a display in the centre of Halifax in the WH Smith window. This year Imagine took on the task of the design, and here's the mock up in our offices. Can't wait to see the end result in the actual shop window, with all the proper lighting! It was a great turn out on the day, and we chose 2 teams of 8 babes, plus 8 reserves. Thanks so much to all who auditioned! The queue around the theatre - this was at 9.15am and doors didn't open until 9.45am! We've uploaded lots more 'beind the scenes' photos of the launch on our Facebook page (in the 'Halifax Cinderella' photo album). Back - Anne Micklethwaite (Fairy Godmother), Jamie-Lee Mason (Dandini), Alice McGreevy (Prince Charming), Nick Barclay and Stuart Slavicky (Ugly Sisters). Front - Jennifer Burrows (Cinderella), Special Guest star Doodles the Dog, Neil Hurst (Buttons). Halifax locals Neil and Jennie have their photos taken by our photographer, Helen. The Ugly Sisters are cast! We are delighted to be able to announce that the Ugly Sisters will be played by Nick Barclay and Stuart Slavicky! We have worked with Nick twice before - he played Fleshcreep in Jack and the Beanstalk (2006) and Abanazer in Aladdin (2008) for us at Loughborough Town Hall. We haven't worked with Stuart before, but know him well as he and Nick have been friends for years. While we were at the Victoria Theatre, we took some photos of the beautiful theatre. Left: The main staircase. Above: Inside the auditorium. Our first cast member does his publicity photos! 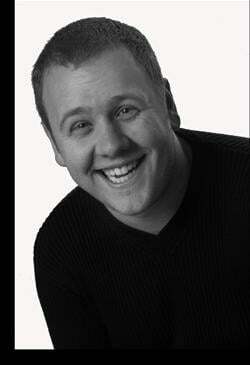 We are absolutely delighted to announce that Neil Hurst will be appearing as Buttons for us at the Victoria Theatre. Neil is Halifax born and bred, and we are thrilled to be working with him - he is hillarious and never fails to have us in stitches! Here's what he got up to during his photo shoot around Halifax! Over the last few months we've been talking alot with the venue via email and telephone (as well as having visited the venue several times previously), but on 1st April we had our first official visit as the new producers of the Victoria Theatre, Halifax pantomime. We were made so welcome by Tim, the venue manager, and Emma and John from the Marketing team. Thank you so much to the team at the Victoria Theatre for choosing us. We can't wait to work with you! WISH is coming to Victoria Theatre, Halifax! WISH is absolutely delighted to be able to announce that we have just been awarded the contract to produce pantomime at the Victoria Theatre, Halifax. We'll be updating this page with more information about the planned production in due course.